Is it time to declare the war on Iran’s inflation over? This is an update on my last post on inflation, which continues to slow down, and a call for letting inflation drop from the top position on the new government’s list of priorities, to be replaced, hopefully, with fighting unemployment. The figures for the Iranian month of Dey (ending on January 20, 2014) published by the Statistical Center of Iran show that inflation is still below 20% for the last six months. (Kudos to SCI for publishing the numbers only one week after the end of the reporting month!) 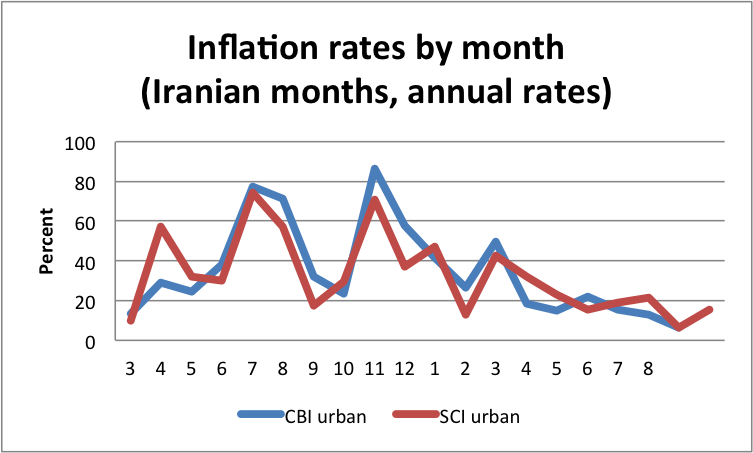 The graph below of the annualized rates of inflation by month clearly shows that, after reaching a peak of over 80% per year in Bahman of 1391 (Iranian month ending on February 20, 2013), inflation has been more or less steadily declining. Significantly, inflation has stayed below 20% for the last several months (the six-month average rate of increase is 18% per year). If you are not able to see the graph click here. Two questions arise. First, if inflation has been below 20% for the last six months, why does the Rouhani budget for the next Iranian year (beginning 21 March 2014) predict it to be 25% for that year? Does the government expect to run a bigger deficit next year than it is currently running? Is it hedging against a breakdown of the Geneva talks? The second question is why does it use the point-to-point and 12-month average rates of inflation, which are still over 30%, when its own price-reporting agencies (the CBI and SCI) provide it with the actual rates every month? Is it exaggerating inflation to keep the public behind its extreme austerity budgets? Of course, it does not help that the Iranian media continues to focus on these longer term measures, which salaried employees, whose incomes are adjusted once a year, use to figure out if they are doing better or worse (though most would have concluded that they are doing worse before doing the math!). It seems to me that the middle class is firmly behind Mr. Rouhani in his attempt to bring down inflation at all cost and does not need to be told that inflation is twice what it actually is. They are even hoping he would stop the payment of the cash subsidy (paid in compensation for the increase in energy prices for the last three years) for unsubstantiated claims that it is the root cause of inflation and other social ills like unemployment today. Monthly inflation data suggest that the fight against inflation is being won, mainly because this was not as hard a fight as people claimed it to be; all that needed to happen was for the government to stop fueling inflation. The types of inflation that are difficult to stop are those that are fueled by struggles over the distribution of income, such as the Latin American inflations of the 1960s and 70s. Iran’s most recent phase of high inflation was caused by changes to relative prices that have largely passed and by printing of money to pay for unfunded government programs. In Iran, wages and salaries have been lagging behind inflation in the last three years, not leading it. Furthermore, the price level has already adjusted to relative prices shifts caused by energy price increases of 2010-2011 and the devaluation of 2012. So that leaves us with the deficits of the three big populist Ahmadinejad programs — the quick-returns projects, low-cost housing (Maskan Mehr), and the subsidy reform cash transfers. These programs have kept inflation running higher beyond what the shocks to relative prices did to inflation. Of these three programs the last one had the smallest deficit and is the easiest to eliminate — by partially eliminating the regressive subsidy to energy — but the government and the parliament resisted doing so. The urban myth surrounding this pro-poor, though imperfect, cash assistance program, from fueling inflation to agricultural workers leaving their jobs despite vast unemployment, will continue as long as the government does not act to eliminate its small subsidy (about $3 billion or 1.5% of the GDP) by raising energy prices to rich households. The quick returns project that sent several banks begging for injection of funds from the Central Bank is old history, but the Maskan Mehr, which we are told accounts for 40% of the monetary base, is still a source of inflation and a thorn on the side of the government. Once the government has found a solution to this program, it can call the fight against inflation over and start focusing on the deeper social and economic problem of unemployment. Thanks for the article! However, as causes for inflation in Iran, I would also add the import oriented currency policy that kept the price of the Rial high while its base was undermined by the destruction of industry. Obviously by taking away subsidies and other government programmes – i.e. cutting the buying power of a large part of society – a downward pressure will be exerted on prices, but this does not change the real underlying problem of which inflation is just a symptom: deterioration of industry and production.